This breed is extremely popular in the United States. 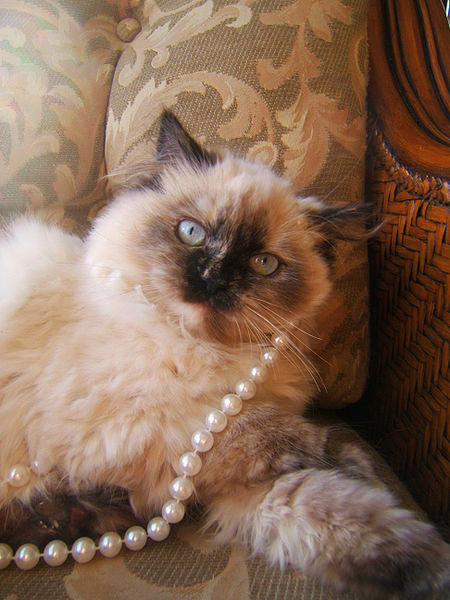 A mix of the Siamese and Persian cat, the breed is a fine boned cat that sometimes can be temperamental. Blame that on the oriental cat component in the Himalayan. The breed sometimes can come across as standoffish but ALL cats can be standoffish at times! One of the most beautiful parts of the Himalayan is its dark blue eyes! You can thank the Siamese cat for donating those genes to the Himalayan. This breed of cat has a long thick hair-coat that has to be brushed and combed on a daily basis. If not, and I have seen it 1000 times, the cat will become one gigantic matte of hair. The only way to take care of that problem is by shaving the cat down in the spring and than to make sure the coat is frequently combed out from that point. Generally, this breed makes a wonderful family pet and is extremely good with young children. It is a social animal and enjoys just hanging out with people. This breed has a bracheocephalic skull. This is seen more commonly in the dog world such as the Pug and Bulldog. This pushed in face feature can cause some medical issues. It can be hard for them to breathe. I have had to surgically enlarge the ollares (nasal openings) on a handful of Himalayan cats to make it easier for them to breathe. There are a bunch of skin folds around the eyes; so an owner has to wipe the eyes daily to prevent staining and eye infections. Because of the natural tendency for cats to groom themselves, Himalayan owners will need to give frequent applications of hairball medicine. A popular brand is Laxatone®. Do not offer the cat Vaseline® jelly for this purpose. Long term, this will cause a deficiency in fat soluble vitamins; namely D, E, K, A. Most hairball products are fortified with these vitamins. Most cats like this stuff and look at it as a daily treat. The Himalayan is a great companion animal for all family situations! Learn more about the Himalayan at Animal Planet’s® Cat Breed Selector.